This page contains pictures and information about Ichneumon in subfamily Tryphoninae Wasps that we found in the Brisbane area, Queensland, Australia. 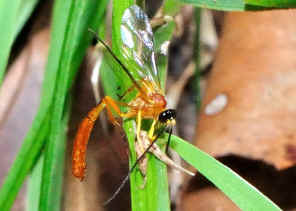 Ichneumon Wasps in Tryphoninae are from small to large in size. 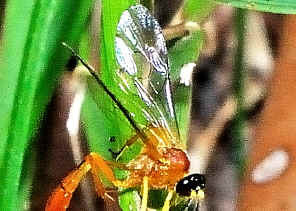 Females are with ovipositor relatively short, not projecting beyond apex of abdomen. Their young are external parasites of sawfly larvae and moth caterpillars. - on the forewing usually with the areolet absent or with small diamond-shaped areolet. Most Netelia species are uniformly reddish orange insects. 1. Insects of Australia, CSIRO, Division of Entomology, Melbourne University Press, 2nd Edition 1991, pp 943. 2. An introduction to the Ichneumonidae of Australia - Gauld, I.D. 1984, British Museum, p72. 4. Netelia producta - Australian Insect Common Names, CSIRO, 2005. Last updated: August 19, 2012.